Except for a small increase in caries prevalence in young children from 1999 through 2004, the prevalence of pediatric caries in the United States has remained consistent for the past 3 decades. The authors used data from the National Health and Nutrition Examination Survey (NHANES) (from 1999 through 2004 and from 2011 through 2014) to ascertain changes in caries prevalence in youth aged 2 to 19 years. 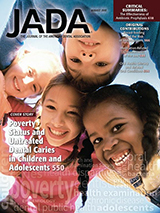 The authors evaluated changes in the prevalence of caries experience, untreated caries, and severe caries (3 or more teeth with untreated caries) in the primary, mixed, and permanent dentition according to poverty status.